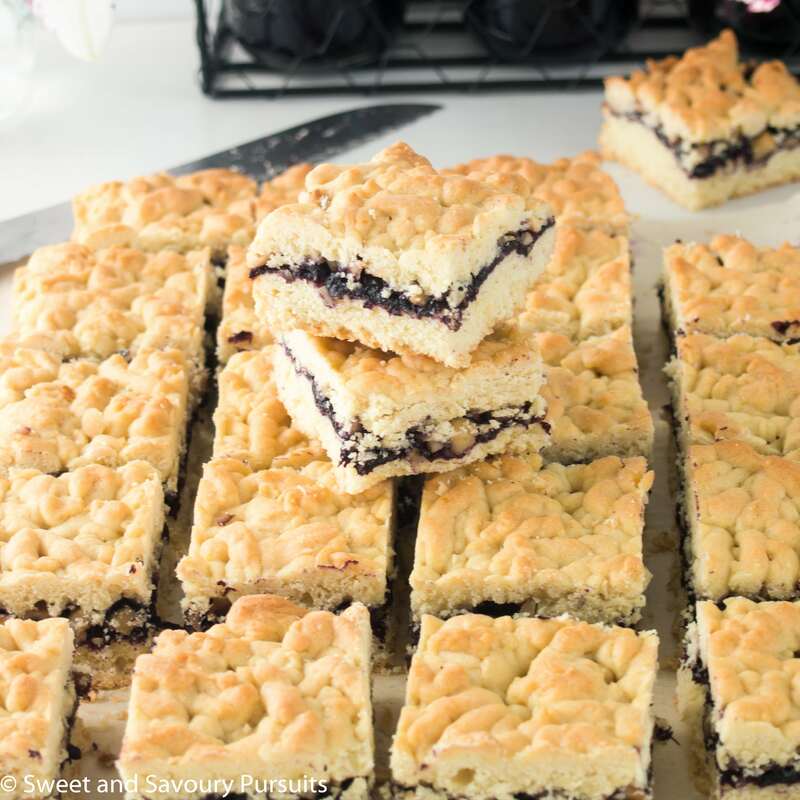 These delicious and easy to make Blueberry Jam and Hazelnut Bars are made with homemade blueberry jam and hazelnuts but you can use your favourite jam and nut combination and put your own twist on them! I used to think that making homemade jam was too complicated and took too much work. But when I looked into the process I realized that if I made small batches that could be consumed within a few weeks I wouldn’t have to worry about the sterilization process to make the jars shelf stable. All I would have to do is refrigerate the jam jars and since that’s easy enough, I proceeded to make my first jam: Blueberry! I couldn’t believe how delicious it was, and all it took was three ingredients: blueberries, sugar and lemon juice. It only took me 25 minutes to have homemade jam that didn’t contain a ton of sugar! Since then I’ve made other jams, but my favourite remains this Low-Sugar Blueberry Jam from Ricardo (you can check out many more Ricardo Recipes on his website). I love spreading this jam on fresh bread with a piece of brie or other cheese, the jam is also excellent stirred into yogurt or on top of vanilla ice cream. After making another batch of blueberry jam, I thought it would be really nice to incorporate it into a baked dessert. I remembered that my mom made a type of dessert bar that contained jam and nuts sandwiched in between two layers of what I can only describe as a cross between shortbread and cake, in Arabic it’s called ‘Biscotta’. 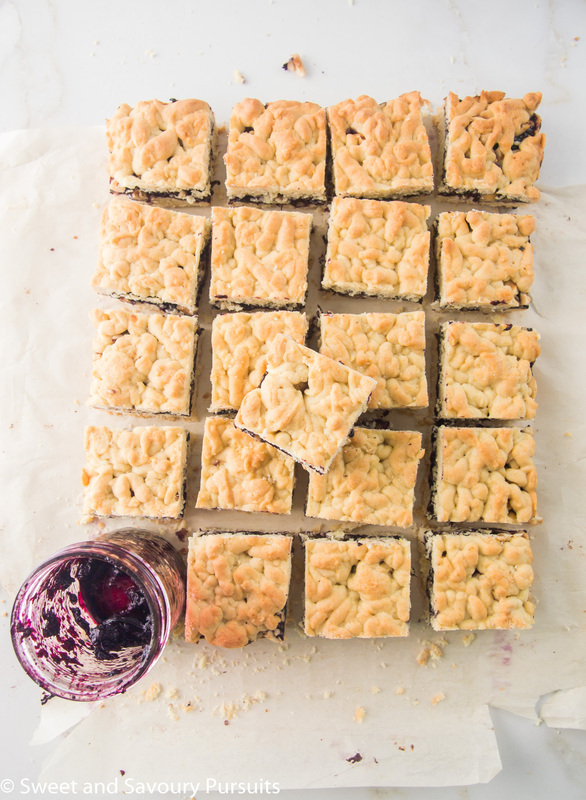 And since blueberries and hazelnuts pair so well, I made a batch of these delicious Blueberry Jam and Hazelnut Bars. The bars came out looking great and tasted amazing, the blueberry jam and hazelnuts worked perfectly in this recipe. 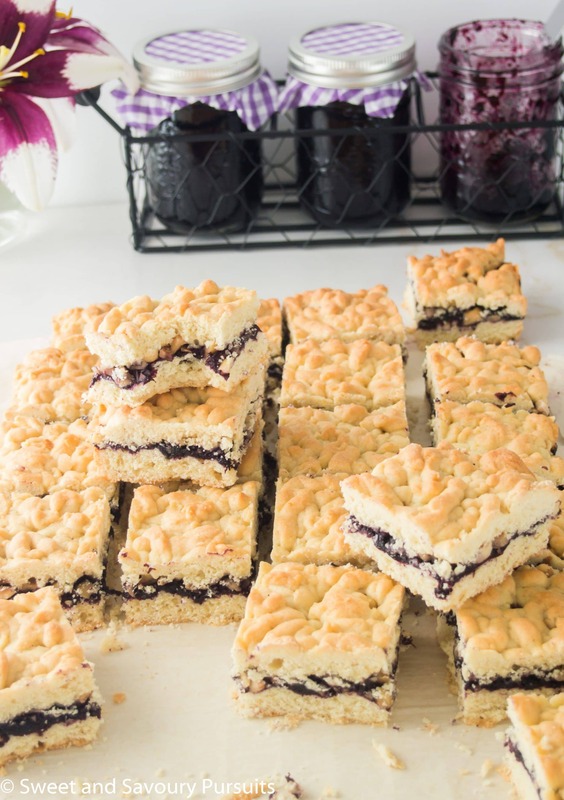 You can serve these bars for dessert, but since they are light and not overly sweet, they also make a great snack and go perfectly with a hot cup of tea or coffee. This recipe is easily adaptable to suit your tastes, feel free to experiment with your favourite jam and nut combinations. I think strawberry or raspberry jam with almonds would be delicious! These bars are made with blueberry jam and hazelnuts but you can use your favourite jam and nut combination and put your own twist on them! Lightly grease a 9x13 inch baking pan and line it with parchment paper making sure to leave a few inches of paper hanging over the sides of the pan. Doing this will make it easier to lift the finished bars out of the pan. In a medium bowl, add the flour (starting with 3 cups, add up to 1/2 cup more only at the end of the recipe if the dough is too sticky), baking powder and salt, whisk and set aside. In a large bowl, add the melted butter and granulated sugar. Whisk vigorously until butter and sugar are well combined. Add the eggs, one at a time, whisking after each addition until egg is blended into the batter. Add the vanilla and lemon zest and whisk into batter. Add one third of the flour mixture and whisk to incorporate into batter, repeat with each third until all flour is mixed in. If dough remains too sticky, go ahead and add that extra half cup of flour. Mix it in the dough and divide the dough into two portion, one just a bit larger than the other. Keep the larger half to work with immediately and place the smaller portion in the refrigerator until ready to use. Take golf ball size portion of dough, shape into patties and press into bottom of pan, repeat this process until the bottom is covered. Gently press down on surface to make sure that bottom is even. Spread bottom half of dough with blueberry jam and sprinkle with the chopped hazelnuts. Remove the other half of the dough from the refrigerator, working with a bit at a time, using the large holes of a box grater, run the dough across the grater to create a crumbled topping. Spread the topping evenly across the top of the bars. Bake until the edges of the bars are golden, about 30 minutes. Place under the broiler for about two minutes until top is golden all across pan. Cool on a rack for 15 minutes and then pulling up on sides of parchment paper lift bars out of the pan unto cutting board and cut into evenly sized bars. The bars can be stored in the refrigerator for 5 days, or frozen for later consumption. I love blueberries and hazelnuts but never had them together, need to give this a try! Hi Judith, I find blueberries and hazelnuts to be delicious together, hope you give this recipe a try, but if you don’t have any blueberry jam or hazelnuts on hand, you can use your favourite jam and nut combination. Thanks for stopping by! You made your own jam!! I have to admit I haven’t done that yet…. 😉 What a way to use it too! These bars look absolutely delightful! Yes I can imagine it would be amazing in these bars! Ooh I love this! I love that the base and topping is the same mixture and the filling is just jam! Simple, delicious and gorgeous. Pinning! Thank you so much Nagi! Yes, so many variations possible, you just have to choose your favourite jam and nut! Mmmm…blueberries and hazelnuts! I’ve only made jam once and I haven’t rushed to do so again. I like this approach to small batches. Small batches are great, plus you can make different flavours so you don’t get bored with the same jam! Thank you Anne! I think it’s delicious!! Thank you Josette! Hope you have a great week! I make a lowfat blueberry jam too – I will have to compare my recipe. Regardless these bars look absolutely delicious – the blueberry crops in Michigan are in! That’s great. I’m loving this blueberry jam from Ricardo. Thanks for stopping by. These bars look so good, Fida! Your homemade jam looks good, too! Thanks Nancy! It’s my favourite jam, it’s so delicious! I enjoy both hazelnuts and blueberries but never would have thought about putting the two together. These look like the perfect little treat. I find blueberries and hazelnuts delicious together and this has turned out to be my favourite variation for this bar recipe. Thanks for stopping by. Great looking bars, can’t wait to try out the recipe. Thanks, I’m sure you’ll enjoy them, you can also switch the blueberry jam for another flavour and change the type of nut you use as well! Fida, I love this kind of fruit bar, they look delicious. And thanks for pointing us in the direction of an easy, low-sugar jam! Thanks Louise! I just love Ricardo’s low sugar blueberry jam, it tastes great and it’s so easy to make! These bars are the perfect afternoon snack. Just the right amount of sweetness with the jam! Delicious. Thanks Christiane! I’m so glad you like them, I thought the amount of sweetness was perfect as well. These bars looks delicious and your pictures are beautiful!